Angela writes: How do you keep a text message from automatically popping up on the iPhone Lock Screen before you even have a chance to check the actual text message—so that if you are at a table with other people, they couldn’t just look over and see? Hi Angela! 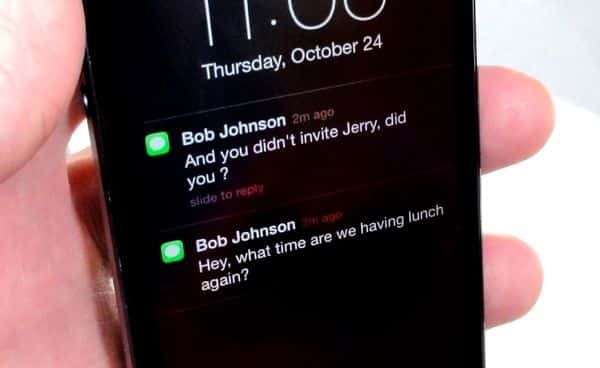 By default, incoming text messages and iMessages will trigger a notification on your iPhone’s “lock screen” (the screen with the “slide to open” slider), complete with a preview of the message—meaning, as you say, that anyone who happens to glance at your phone could read your latest texts. For some, that’s no big deal; others, though, may want to keep their SMS and iMessage chats a bit more private. The good news, though, is that you can easily hide text-message previews from your iPhone’s lock screen by tweaking your Notification settings. 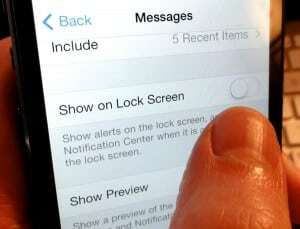 Just flick a switch to keep your text messages from appearing on your iPhone’s lock screen. From your iPhone’s home screen, tap Settings, Notification Center, then scroll down to Messages. Next, scroll down until you see the setting for Show Preview, then flick the switch to “Off.” From now on, text and picture message alerts on the iPhone lock screen won’t give you a sneak peek of the message itself, although you’ll still be able to see who sent a given message. You can also disable text and iMessage alerts completely by tapping “None” in the “Alert Style” section, or nix the red badge on the Message app by switching off the ‘Badge App Icon” setting. Last but not least, you can silence the “ding” of an incoming text message. Tap the Alert Sound setting, then select “None” from the big list of alert tones. Hope that helps, Angela. Still have more questions? Post ’em below, or send me an email.